Originally published in the Yellow Springs News on Mar. 18, 2016. Roughly 10,000 tickets were given away for a Trump rally in Vandalia over the weekend, drawing supporters from Columbus and all over southwestern Ohio. Trump was due to arrive at 10 a.m. and some of his supporters had been lining up to see him since 5 a.m. 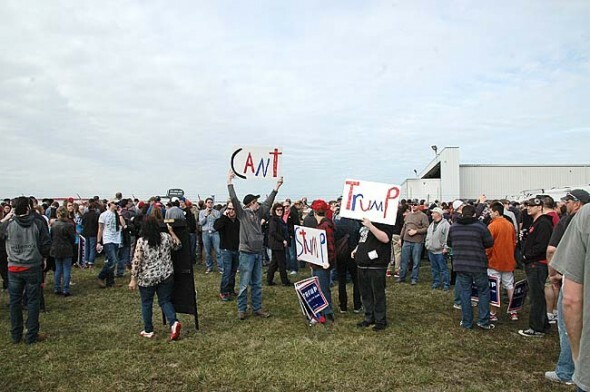 The rally was held in an airplane hangar on the edge of the Wright Bros Airport, as Trump would be arriving in his own plane and walking straight to the podium. Traffic was backed up from the airport to the highway, and cars were parked willy-nilly along the road for at least a mile. Protestors, from a variety of lefties to Ted Cruz supporters, lined the road as well. Occasionally someone could be seen dashing back to their car with a purse or bag, as such items were banned from the rally. After parking wherever a spot could be found, hundreds of people walked together towards the hangar. Families walked alongside elderly couples, groups of teenagers, and camo-wearing men. Most attendees seemed to be older than 30. 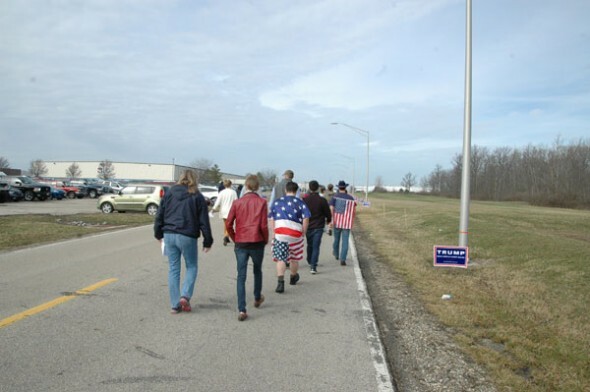 The sky was clear and the weather crisp, which, coupled with the amicable chatting among supporters, the walk to the hangar felt like a stroll down a boardwalk. Indeed, a Trump lookalike was walking around and asking people if they wanted to take a picture with him, and a number of vendors were hawking Trump hats, scarves, and t-shirts from the backs of cars or wagons they pulled through the crowd. A number of attendees were speaking with TV and print reporters about why they support Donald Trump’s bid for president. A young man walking to the hangar yelled “Don’t trust the liberal media!” at someone with press credentials hanging from his neck. Pepe Hasty had come to the rally from Dayton with his wife Alicia. It was Trump’s business experience that really spoke to Pepe. Trump’s business acumen won’t bankrupt the country. He’s hired and fired some people, Hasty said, so he’ll get us out of our deficit. Alicia Hasty, Pepe’s wife, took issue with Obamacare, as she said it eliminated all the medical benefits she was getting as a result of being hit by a drunk driver 20 years ago. That a celebrity was in the area was another draw to people as well. Going to the event was something entertaining to do, said Robert, who was attending with his ten year-old son and declined to give his last name. But Robert also emphasized the importance of being involved in the political process. He was actually a Ted Cruz supporter, and explained to his son that there were still many Republican candidates because midterm elections hadn’t happened yet. His son, wearing a shirt with the phrase “Cool story babe, now get me a beer,” nodded along. By 9:45 a.m. admittance to the hangar had long been stopped. 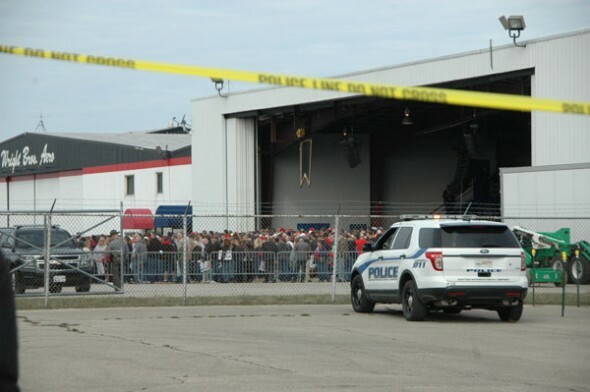 According to a police officer on the scene, approximately 9,000 people were inside, and the capacity crowd surrounded the stage on all four sides. Latecomers were diverted to an area outside the fence surrounding the hangar and its tarmac, a significant length of which was topped with barbed wire. Groans echoed through the crowd as news travelled that nobody could get any closer. 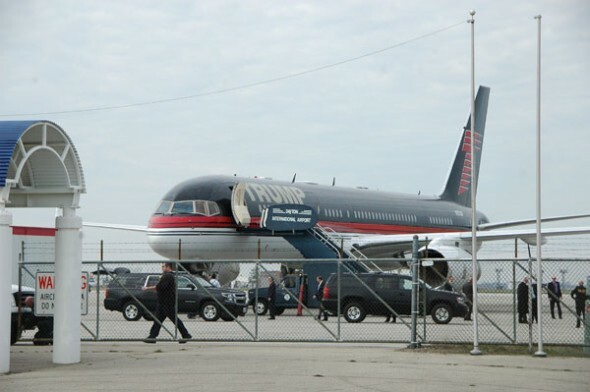 The only option was to view Trump from approximately 500 feet away and listen to his speech via the crackling speaker system set up around the tarmac. The start was delayed and the vantage point was disappointing, but the bonding among supporters along the perimeter continued. People swayed easily on their feet, hands resting in their front pockets, chatting about where they were from and how they’d gotten there. Shared or rival sports teams were hailed or derided. Their demeanor remained more or less unchanged even as a group of anti-Trump demonstrators threaded their way into the crowd. Roughly 150 protestors, including a number of people from Yellow Springs, walked in a tightly packed group into the middle of the crowd gathered along the fence. Most were bearing homemade signs with slogans like “Trump is a terrorist” and “Keep hate out of Ohio.” They came in singing, their eyes moving across the crowd as they took their position. Some Trump supporters responded with sidelong glances and muttering. Others appeared unbothered by their arrival, and even bid the demonstrators good morning. At one point, two teenage girls broke away from the protestors and wound their way through the crowd arm in arm, looking at each other nervously, holding their signs mid-height. A few Trump supporters looked at them with a twinge of sympathy, surrounded as the girls were. Protestors have been a fixture at Trump rallies, and there have been widespread reports that they are threatened with and have even faced physical violence. Trump’s rally scheduled in Chicago the night before was cancelled for security reasons. It was the cancellation that made Chip Roberts, who had travelled from Columbus, decide to come to the rally. He said he was “infuriated” that the Chicago rally was cancelled, as “everyone has a right to say what they want.” But Roberts felt “Ohio does it right” when it comes to protesting, as he said the protestors were being civil to supporters. At 10:35 vehicles started moving on the tarmac and a worker with fluorescent batons took his position on the runway. The crowd pressed in to the fence and craned their necks towards the hangar. Up until this point the music playing over the PA was barely audible, but suddenly the music swelled with newfound volume and clarity to herald the arrival of an airplane lumbering around the corner, the word TRUMP painted front and center in bright red letters. The sense of idleness dissipated immediately at this powerful sight. The crowd began waving everything from flags to yard signs with the metal legs still attached. When the plane’s door opened, the crowd cheered. When Trump emerged and waved, the crowd’s roar became even louder. Chip Roberts, who dropped our conversation when the airplane door opened, swooned like a fan in those old videos of the Beatles taking the stage. The crowd began chanting “USA! USA!” and the protestors ratcheted up their enthusiasm with a volley of extra-loud anti-Trump sloganeering that continued at top volume for the next fifteen minutes. Trump was accompanied to the stage by these dueling voices, and began immediately talking about why his rally in Chicago was cancelled the night before. According to Trump, the event was cancelled due to the meddling of “wiseguys,” establishment politicians who want to silence the outsider candidate. The crowd roared in approval. Many of those that could see the protestors turned and jeered at them. “Are we having fun, folks?” Trump asked. In the speech that followed, Trump touched on jobs lost to overseas competitors and his problems with NAFTA. He noted that he had the support of religious luminaries like Jerry Falwell and Sarah Palin over the openly evangelical candidate Ted Cruz, who, he said, is nothing more than a “liar.” He called ideological enemies “animals” and complained that political correctness prevents effective political action. A “build the wall” comment was met with a call and response cheer. The crowd seemed to be waiting for the moment that Trump would discuss his goal of forcing Mexico to build and pay for a border wall. Supporters seemed to know exactly what to yell when prompted. At another point in the speech, Trump lingered on the promise that he would do to the country’s enemies something ten times worse than what they are doing to us, whether they be ISIS or foreign manufacturers. At one point, a man tried to rush the stage and was tackled by the Secret Service and taken across the tarmac to a police vehicle. This was met with enormous applause. The protestor screamed at the crowd as he was led out, and the crowd likewise responded with derision. Trump responded calmly, telling the crowd that they couldn’t let their opponents stop them. It’s us versus them, he said. The physical distance between supporters and opponents shrank as Trump’s speech continued. Supporters surrounded pockets of protestors, creating small groups engaged in their own debates. Initially people were standing with their arms at their sides or raised in cheer, but now arms were crossed and postures were defensive. A few people were walking from argument to argument and filming the action close up with their phones. Trump’s voice was drowned out by the numerous debates and chants from both sides. One protestor turned away from a particularly vocal supporter, who stomped from one foot to the other and waved her Trump sign around less than a foot from a group of demonstrators, screaming until she was literally red in the face. One Trump supporter, Amelia Dluski, was so angry with the protestors that she could barely speak. She walked off to the side and smoked a cigarette, saying she had to calm down. She said their “delivery was all wrong” and that she had to defend some little girls in the crowd from the unruly demonstrators. They were only working to convince people to vote for Trump, she said. All in all, Trump spoke for about 40 minutes. He lambasted Ohio governor John Kasich for being “too soft on immigration,” and said the country was weak overall. “The country is soft, the leadership is pathetic, and it’s got to change,” he said. Due to the faulty speakers, the sound of Trump’s speech gradually decreased in volume and quality, and the last ten minutes of his speech were almost unintelligible. Nevertheless, supporters paced back and forth on the asphalt. Two large men were clenching and unclenching their fists and discussing what to do next. “Let’s punch a few protestors on the way out,” one said. When the speech finally concluded, everyone turned to walk back down the road they came in on. People chatted as they walked, much as they did earlier, but the feeling in the air was different. The crowd, beaming and cracking jokes when they arrived, walked away scowling, heads down, ignoring the vendors and venting to their neighbors. This final energy accompanied a supporter wearing an ICE (Immigrations and Customs Enforcement) hat, who found herself walking to her car next to some protestors. They were arguing about the merits of Obamacare. “At least I didn’t grow up on welfare!” she spat.